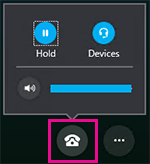 Skype Meetings automatically detects and selects the most compatible audio device for your meeting. If you want to change your audio device, go to Call controls > Devices and select the device you want. On the Audio tab, click or tap the current device to see other available devices.